Integration: An American Dream – What is American Food? Food is vital for life. Not only because it provides the nutrients humans need to live, but also because it elicits pleasure, strengthens bonds, and unlocks opportunities. Food’s essential place in our daily lives makes it a pertinent topic for discussion, investigation, and critical thought. The Pinterest posts on our “What is American food?” board present a varied and thoughtful view on this quintessential question. Although there is no correct answer to the question, central themes pertaining to American food are evident. Characterized by the desire for success, belonging, and adaption, American food culture is about the diverse ways food fosters integration—it infuses immigrant cuisine with staple foods, promotes community-building for migrants, and helps marginalized groups partake in the American Dream. Immigrants and other marginalized groups in America use food to strengthen communal bonds. In general, most food has a social aspect to it, and this fact is apparent in our Pinterest pins. People pinned foodstuffs, such as a buffet meal, hot wings, and beer. One pertinent pin to this topic was barbecue, a food that undoubtedly brings people together. The word has become synonymous with a gathering because of its inherently social nature: “we are having a barbecue.” Another example was gingerbread houses—the fun is in assembling and decorating them with loved ones. Finally, Thanksgiving is the archetypal combination of food and socialization; the purpose of the holiday is to commune with friends and family over a bountiful feast. Thus, food is a pleasure people like to experience together, and that shared enjoyment shapes and strengthens connections. More specifically, food’s ability to fortify communal bonds is most visible in migrant communities. Many of these migrants arrive in America unfamiliar with the customs and devoid of a support system, so food becomes a way to smoothly transition into American culture and connect with other people. The article, “Hungering for America: Italian, Irish, and Jewish Foodways in the Age of Migration” contends, “Preparing and consuming food together solidifies social bonds within families, between households, and among individuals who consider themselves friends.” An apt example of migrants using food to acclimate themselves to America is Italian immigrants. Hasia Diner, the article’s author, states, “Feasting upon dishes once the sole preserve of their social and economic superiors enabled them to mold an Italian identity in America around food.” Since ethnic groups began migrating to America, they have found common ground in cooking, eating, and selling food. In accordance with this distinctly American tradition, Italian immigrants created communities around food, which they could now consume in abundance. When migrants come to America, Americans integrate their cuisines into our traditional foods. This fusion has a long history: Ever since Europeans settled in America, they have adopted foreign ingredients and flavors into their culinary repertoire. Donna Gabaccia supports this claim in her book, We Are What We Eat: Ethnic Food and the Making of Americans. She contends, “The American penchant to experiment with foods, to combine and mix the foods of many cultural traditions into blended gumbos or stews, and to create ‘smorgasbords’ is scarcely new but is rather a recurring theme in our history as eaters.” The Pinterest board displays countless examples of this phenomenon. The pizza bagel, a favorite snack of young adults, combines bagels from Jewish immigrants and pizza, which is an Italian dish. In “The Origins of Soul Food in Black Urban Identity,” Tracey Poe provides another example: soul food. Soul food is a mixture of African and European flavors—African slaves infused American food with their traditional dishes. Mainstream America now accepts soul food, which is often the case with cultural dishes—they build community amongst their originators and are eventually assumed by the larger American culture. In her article, “Why everyone should stop calling immigrant food ‘ethnic,’” Lavanya Ramanathan explains a major downside to Americans co-opting immigrant food in this way. She states, “Immigrants’ identities are deeply tied to the foods we bring with us. When we hear our cuisine described as exotic, hodgepodge, greasy or cheap, you might as well be remarking disdainfully about our clothes or skin color.” When immigrant food comes into the mainstream, it becomes liable for criticism, and this criticism pains immigrant groups because of the importance they place on their culture and cuisine. Roberto A. Ferdman elaborates on this point in “How Americans pretend to ‘love’ ethnic food’” by asserting, “Our palate has undergone something of a renaissance over the past century, evolving to incorporate the cuisines of the immigrants who have made the United States their home. But we have incorporated these foods on our terms — not on theirs. We want “ethnic food” to be authentic, but we are almost never willing to pay for it.” Therefore, the degrading views Americans typically hold regarding ethnic food harms immigrants financially. While America is made stronger by its enthusiasm for immigrant foods, this zeal turns problematic when racial prejudices and Western superiority become involved. On the plus side, immigrants and other marginalized groups in America use food to amass wealth and gain social capital. The Pinterest board contains numerous pins about the ways food can exacerbate inequality: expensive avocado toast, Blue Apron’s exclusivity, and the diet constrictions of the EBT card. Despite food’s ability to enforce socioeconomic lines, it can be commodified to rise above poverty. Some posts on our Pinterest board display this concept. One example is East Side Pockets, which has an origin story typical of America. In 1990, Alexander Boutros left his family of five in Syria to immigrate to Rhode Island. Once the rest of his family arrived in Rhode Island, they opened the now celebrated falafel restaurant. Like many American immigrants, the family makes a living by preparing food from their culture. The Boutroses are now esteemed members of the Providence community and have expanded their business. Another example is the Rhode Island Community Food Bank. The Community Kitchen Culinary Program offers a free 14-week culinary job training program to people who are struggling financially. Thus, the program displays American food’s ability to help break the cycle of poverty. Prior to being laid off from a series of short-term occupations, Jessica Salvas applied and was accepted to the program. Now, she works at a local Providence restaurant and earns a comfortable wage. These success stories display food’s capacity for good—it gives marginalized Americans an opportunity to achieve the American Dream. American food reflects American culture. That means the good and the bad in American culture is found in our food. From its preparation, consumption, and commodification, food can be an oppressive and liberating force. American food is a mix of various cultural cuisines, but this infusion often comes at the expense of these cultures. Their food is co-opted with little to no repayment or concern for its integrity, which contributes to the current view that most ethnic food is low-quality. Despite its power to enforce America’s prejudices, food is a tool that can be wielded for economic and political empowerment. 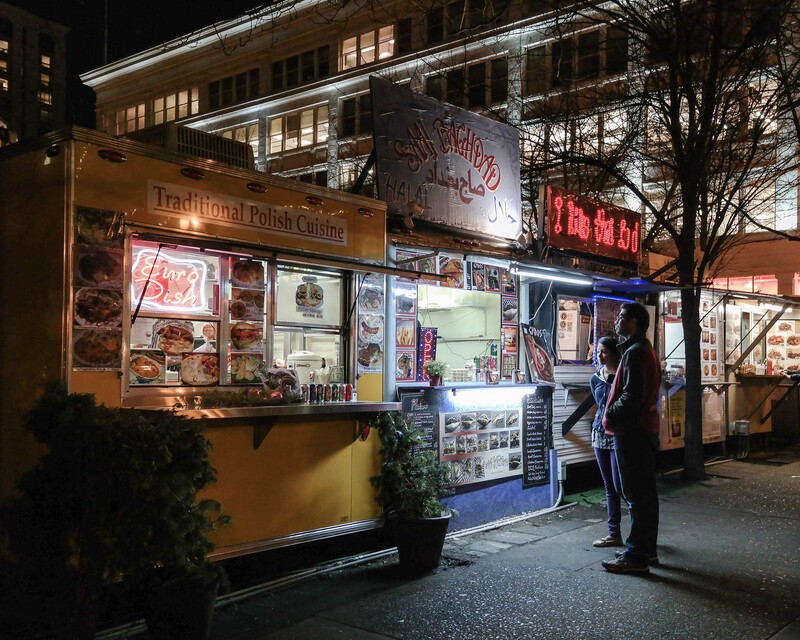 From food carts to corner stores, marginalized groups commodified food to make a comfortable life for themselves. Most importantly, American food is about connections—it has an ability to conglomerate individuals to build communities. Diner, Hasia. Hungering for America: Italian, Irish, and Jewish Foodways in the Age of Migration. Cambridge: Harvard University Press, 2001. Diner. Hungering for America: Italian, Irish, and Jewish Foodways in the Age of Migration. Gabaccia, Donna R. We Are What We Eat: Ethnic Food and the Making of Americans. Harvard University Press, 2000. Remanthan, Levanya. “Why Everyone Should Stop Calling Immigrant Food ‘Ethnic,’” The Washington Post (July 21, 2015). “Special to The Providence Journal,” East Side Pockets, accessed April 24, 2017, http://www.eastsidepocket.com/esp_projo2007.html. “Cooking up for a better tomorrow,” Rhode Island Community Food Bank, accessed April 24, 2017, http://rifoodbank.org/breaking-cycle-poverty/.